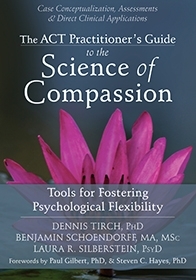 Dennis Tirch, PhD Founder of the Center for Compassion-Focused Therapy, CFT trainer, author. Laura Silberstein-Tirch, PsyD Director of Center for Compassion-Focused Therapy, CFT trainer & ACT Expert. Compassion-focused therapy (CFT) is a cutting-edge psychotherapy that takes the "third wave" of psychotherapy further, by expanding the frontiers of mindfulness and acceptance into a deliberate awakening of our compassionate mind. For thousands of years, wisdom traditions have used mindfulness and acceptance methods as a platform to transform the mind through compassion training. CFT puts that process in your hands, drawing on rigorous behavioral psychology, neuroscience, and evolutionary theory. This online course will review foundational CFT concepts, and will then take participants beyond the basics into advanced CFT experiential exercises that can address a range of problems. This is an opportunity to integrate deeper dimensions of compassion work into your practice, while renewing your understanding of the fundamental dynamics of mindfulness and compassion. This 8-week course is the second half in a pioneering, 16-week comprehensive online learning experience in CFT training. Our work over the 8 weeks can build on your previous training, or stand on its own, and there is no requirement that you have taken part in other Praxis CFT trainings, or any prior CFT training. This workshop will present the working definition of compassion utilized in CFT, will review Paul Gilbert's CFT model of emotion regulation, and will go further to explore how compassion functions as a series of interacting processes and procedures. This constellation of psychotherapy processes can strengthen our ability to turn toward painful experiences, help us work with human suffering, and can cultivate values-based movement in our clients’ lives, and in our own. You will leave this workshop armed with a range of techniques rooted in CFT, and an enhanced understanding of what the embodied compassion motive represents. For example, you will learn how to use compassion embodiment in the therapeutic relationship, active meditative imagery practice, and CFT chair-work and role-play practices to help clients work courageously with life challenges. Appropriate for newcomers to CFT and veterans alike, and taught by some of the foremost CFT experts in North America, this workshop presents a novel approach to understanding the therapy aimed at helping you advance your compassion work. Together, we will build a road map toward increased compassion-based living, mindful courage, and psychological flexibility. This training is specifically designed to help acceptance and commitment therapy (ACT) and other behavior therapy practitioners deepen their understanding and practice of compassion-focused treatment. Through small group work and a series of experiential exercises, you will build the foundation needed to advance your CFT skills base, and to grow as a clinician. And you will get to have your questions and concerns addressed by top trainers in CFT, including the form's originator, Paul Gilbert, who will be joining us as a special guest for one of the sessions in this training. Beyond the Basics of CFT – Introducing the CFT Model and the history of mind training and compassion cultivation in global meditation traditions. Introduction to compassion-focused practice for personal development. The Evolutionary Model of Compassion and Affect Regulation – Specific CFT-consistent affect regulation strategies, tools, and ways of working with difficult emotions in session. Working with Worries, Anxiety, and Fears from a Compassion-Focused Approach – The functional analysis of fear and the cultivation of compassionate courage. Compassion-focused exposure and response prevention. Compassion, Attachment and Psychological Flexibility – How to experientially develop psychological flexibility using compassion training in session and through self-practice. Working with Eating Disorders and Impulse Control Disorders Using CFT – Specific CFT practices for working with challenging problems. Overcoming Depression and Mood Disorders Using CFT. CFT Case Conference and Supervision – How to utilize ongoing CFT consultation teamwork to develop effective interventions and community support for CFT work. Working with Complex Relational Trauma and Personality Disorder Presentation Using CFT. Describe the foundational evolutionary model of compassion, mindfulness, and emotion used in CFT, and relate it to core concepts in meditation traditions and in functional-contextualist theory. Demonstrate use of the CFT “Three Circle Model” of emotion regulation in clinical contexts. Explain how to relate this model to the science of emotion regulation. Demonstrate deployment of CFT-consistent affect regulation strategies, tools, and ways of working with difficult emotions in session. Explain how to use CFT to work with worries, anxiety, and fears, including the functional analysis of fear and the cultivation of compassionate courage. Apply compassion-focused exposure and response prevention in session. Experientially develop psychological flexibility using compassion training in session and through self-practice. List techniques for treatment of eating disorders and impulse control disorders using CFT. Explain evidence-based treatment of depression and mood disorders by using CFT-consistent strategies. Deploy strategies for working with complex relational trauma and personality disorder presentation using CFT. Apply specific therapist micro-skills and active therapy processes that can lead to greater flexibility and adaptive responding in the moment. Apply collaborative case conceptualization based upon the attributes of the compassionate mind. Apply a range of specific techniques that are focused on cultivating the competencies of compassion in the therapy relationship. Train and implement compassionate mind training, in the service of cultivating the competencies of compassion. Explain the “compassionate ideal” and other advanced imagery practice in helping clients develop compassionate strengths. Demonstrate use of a range of CFT imagery practices, and introduce them in individual and group therapy contexts. No books, courses, or journal articles are required prerequisites for this course, but the list of recommended readings below will help to enhance your experience. For mental health professionals: beginners through intermediate and on to advanced practitioners. The course will be appropriate for clinicians of any background, and professionals with CFT, ACT, and cognitive behavioral therapy (CBT) training may find the concepts more familiar and readily user-friendly. Kirby, J., Steindl, S. & Tellegen, C. (2017). A Meta-Analysis of Compassion-Based Interventions: Current State of Knowledge and Future Directions. Behavior Therapy. 48-6. 778-792. Braehler, C., Harper, I., & Gilbert, P. (2012). Compassion focused group therapy for recovery after psychosis. In C. Steel (Ed. ), CBT for schizophrenia: Evidence-based interventions and future directions (pp. 235–266). Chichester, West Sussex, UK: John Wiley and Sons. Lutz, A., Brefczynski-Lewis, J., Johnstone, T., & Davidson, R.J. (2008). Regulation of the neural circuitry of emotion by compassion meditation: Effects of meditative expertise. PLoS ONE, e1897. DOI: 10.1373/journal.pone.0001897. Mental health professionals. Includes access to Continuing Education certificate after the course.